A lantern-lit porch overlooking a busy street in Szechuan, China crowded with car and bicycle traffic…or a screened veranda looking out over a bend in the Ubangi River along the southern border of the Central African Republic..or a terrace nestled hgh in the treetops of a quiet old Viennese neighborhood…or a walled tropical garden in the heart of Kinshasa…all of these have provided settings for diplomatickitchen dinners. What they all share is the expansive and generous esprit that eating out-out-of-doors somehow creates. This newest diplomatickitchen menu is: Dining al fresco. The menu emphasizes ‘plant life’ and the kindly feel of the cool of a summer evening. Carafes of wine, both red and white, to accompany it, would not be amiss. Timing Note: The pizza is served hot from the oven as an hors d’oeuvre. It has been served very successfully at room temperature for a picnic also. 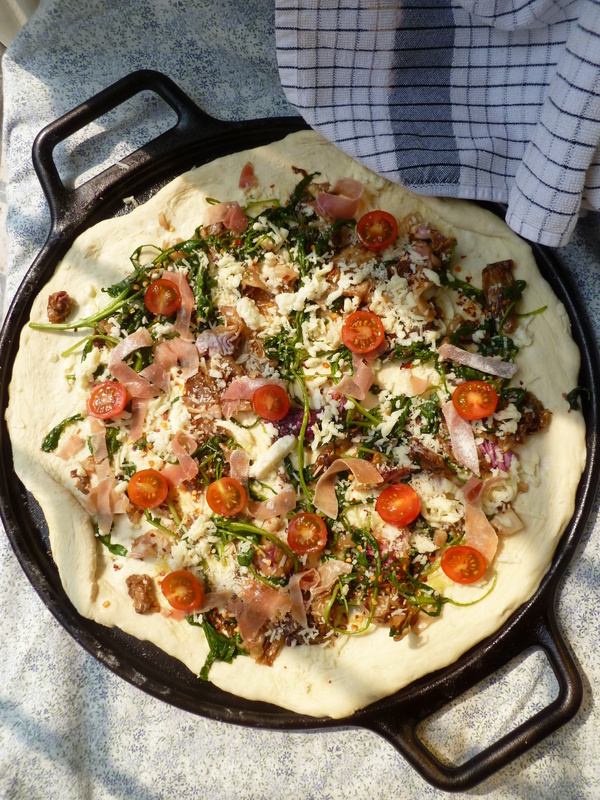 1 Pizza Pan: Lodge Cast Iron Pizza Pans are used for the photographed pizzas. 2. Oil the pizza pan well or, if using an open-holed pan, oil the rim of the pan well and the bottom lightly and place a piece of parchment paper over the holed area of the pan. 4. Lightly flour the pastry board and roll the dough into a 14-inch round. Transfer the round to the pizza pan and form a slightly raised edge all around the circumference of the circle of dough. 5. Brush the tablespoon of oil in which the garlic slices cooked over the round of dough. Scatter the slices of golden garlic around over the dough. 6. 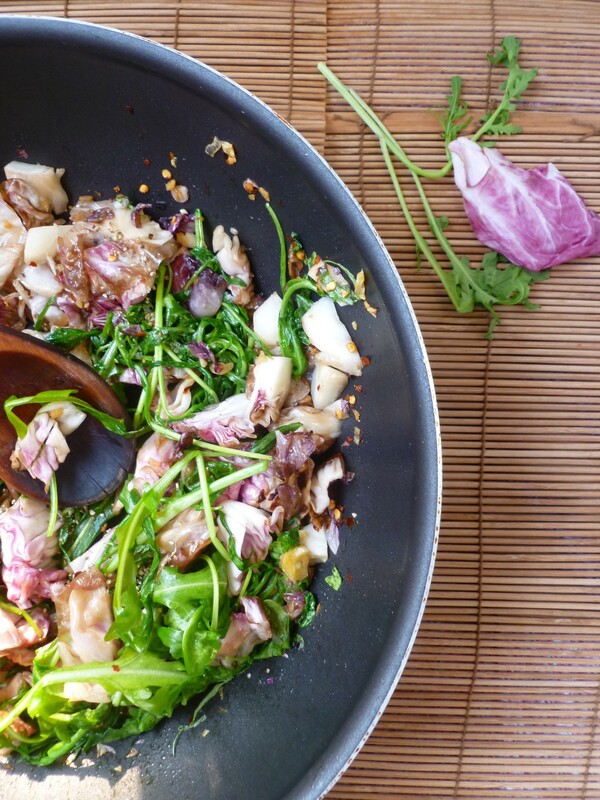 Scatter the stir-fried greens over the dough. 7. Sprinkle the mozzarella over the dough, then, the Parmesan. 8. Scatter the strips of Proscuitto over the cheese. 9. Lastly, arrange the halved cherry tomatoes on the pizza. 10. 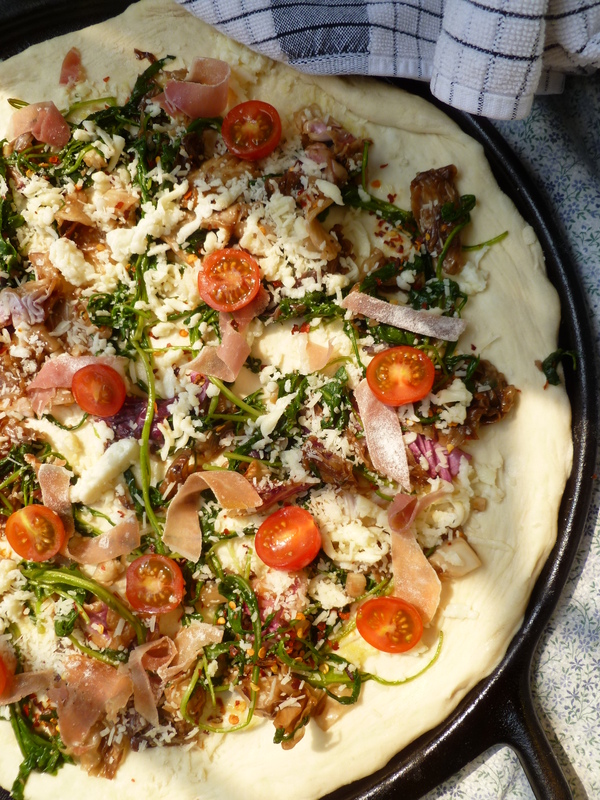 Bake the pizza for 12 – 15 minutes…or until it is golden. 11. If the pizza is served as an hors d’oeuvre, slice it in thin wedges and serve straight from the oven. Rustic Bread Dough Redux: enough for 1 14-inch pizza…double the measurements for 2 pizzas of this size. Note: A reader recently wrote to me to say that she had tried the dough recipe given below and found it to be too ‘liquid’. 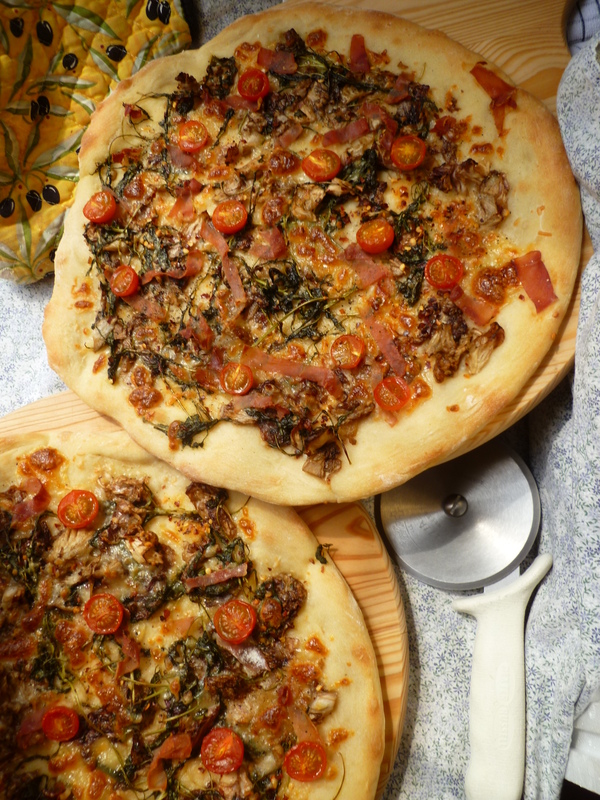 She instead used her own pizza dough recipe and pronounced the result very successful. Flours, yeasts and altitude vary and can change the results . For this dough I used an unbleached bread flour and a French yeast that is widely available in the United States and Europe (Saf Instant Yeast). I have made the dough on multiple occasions with little variation in the result and this is the first problem with it that a reader has brought to my attention. I’m sorry it didn’t work for you Judy, and I wish I could figure out what the mischievous variable was. 1. In a small bowl, mix the yeast with 3/4 cup of the warm water and a pinch of sugar. Set it aside until the top is covered in a foamy froth, the color of Crayola crayon taupe. Add the olive oil. 2. Scrape the foamy yeast into a larger bowl. Add the salt and the flour. 3. Stir the mixture until it begins to form a dough. Then, flour your hands and finish forming the dough by hand, pressing it together and kneading it. Once the mixture forms a coherent ball, turn it out onto a floured pastry board and continue to knead it until it is soft and elastic. 4. Clean and dry the large bowl and oil it with a little olive oil. Place the dough in it and cover it with a piece of plastic wrap. Let it rise for about an hour (or longer, if the room temperature at which the dough rises is very cool). 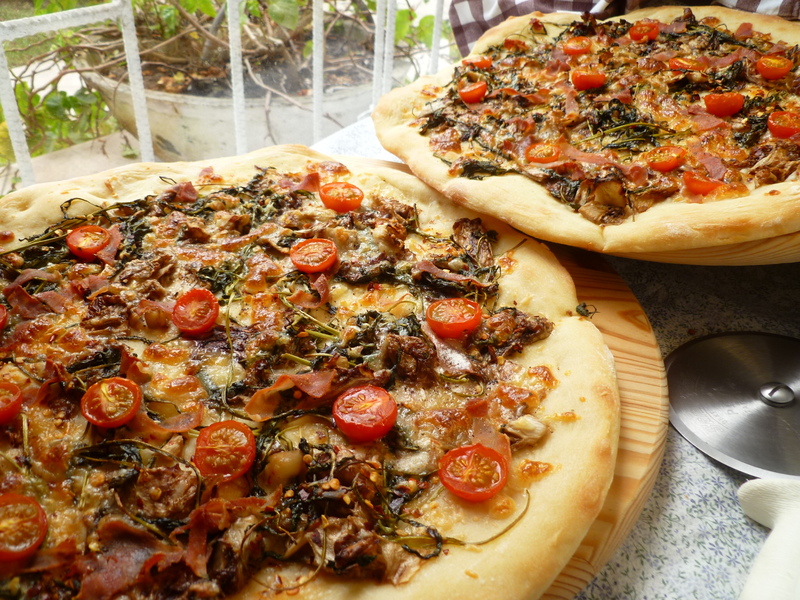 The dough is ready to roll out for making the pizza when it has doubled in size–but it is not of the high rising sort. 4 bunches of Roquette (aka Arugula) or 2 cups: Roquette is sold by the bunch in some places. 1. Leave the roquette leaves whole. Wash and dry them well, along with the radicchio. 2. 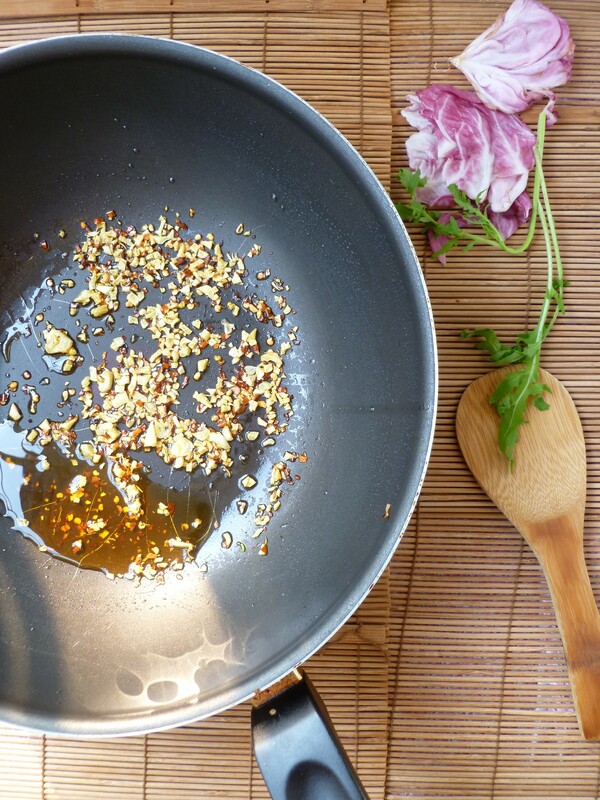 Heat the oil in the wok over medium heat until it barely shimmers. Add the garlic and red pepper flakes and cook them, stirring, for about minute or until the garlic just begins to brown at the edges. 3. 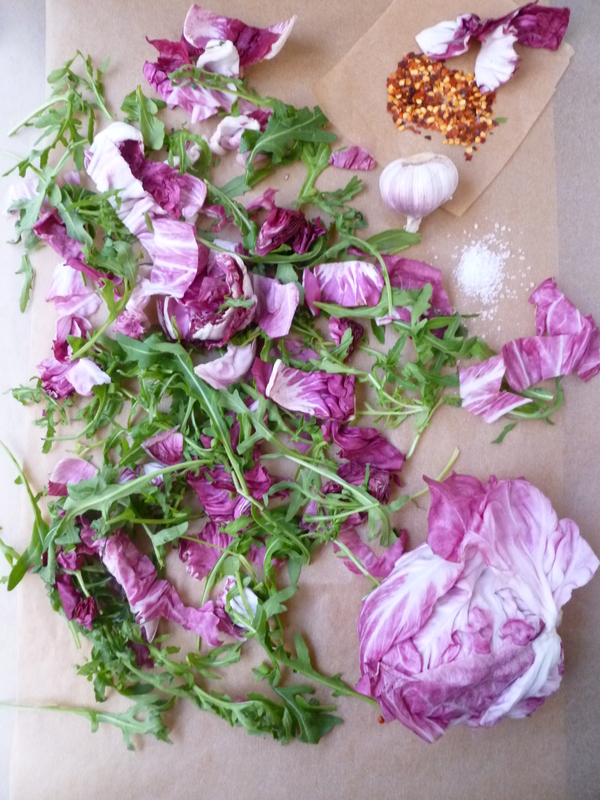 Add the roquette and radicchio and fry them, stirring, for about 2 minutes–just until they begin to wilt. 4. Remove the wok from the burner. Toss the kosher salt and coarse black pepper. This amount of arugula and radicchio will be enough for 1 14-inch pizza. 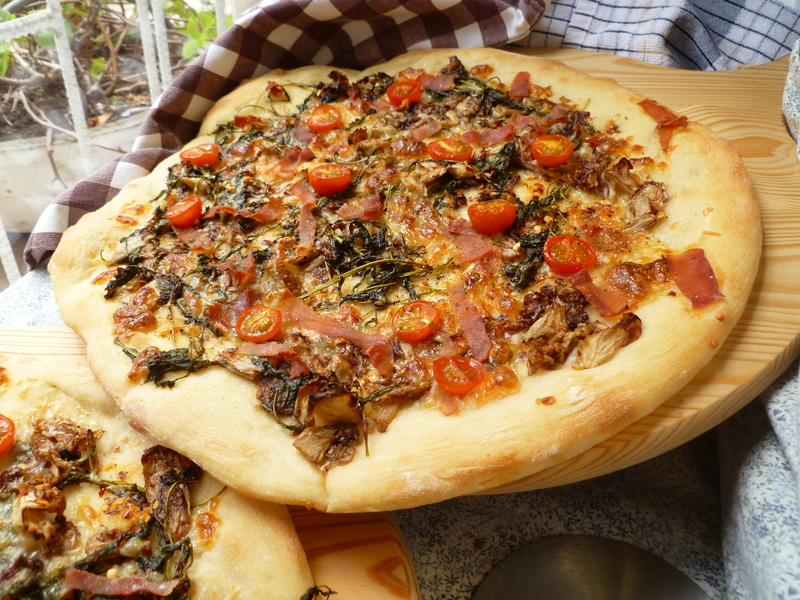 A Note: Arugula and Radicchio Rustic Bread Pizza is cut into thin slices and served as an hors d’oeuvre in the Dinner Menu: Dining al fresco. An Invitation: You are invited to request suggestions from the diplomatickitchen for your own menus for any occasion by clicking on the feature ‘Ask and Tell’ here or in the Menu at the top of the page. Do you have a menu concept with a gap or two that wants filling…or perhaps you are an exat looking for ways to adapt your recipes to what is available in your temporary home…maybe you are just looking for a new way to use a familiar ingredient or would like suggestions on how to adjust quantities of a recipe from the diplomatickitchen for smaller or larger groups…Replies will be published in ‘Ask and Tell’ or sent by email if you prefer. Looks great! Do you have any suggestions for preparing gluten free crust? Hi Cecile…hope you are enjoying settling into your new home. Re: gluten free..unfortunately I have never tried one.